Its raining cats and dogs in Chennai and that doesn't happen very often. 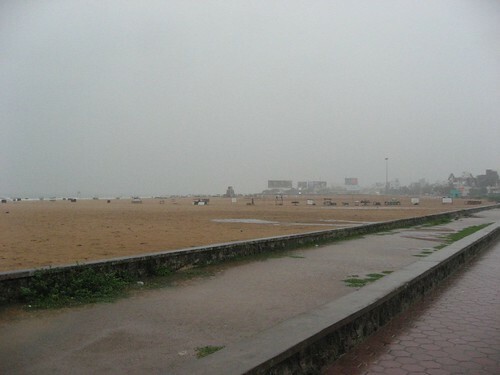 Chennai is perennially rain (and thus water) starved city. So, it is kind of a welcome relieve to see the continuous downpour since yesterday. This gave me the perfect reason to skip today's long run and kept me indoors most of the day. Feeling claustrophobic, decided to venture out a little and here are couple of pictures from that. Elliots Beach is generally Choc-a-Block with people on a Sunday after noon, but not today. 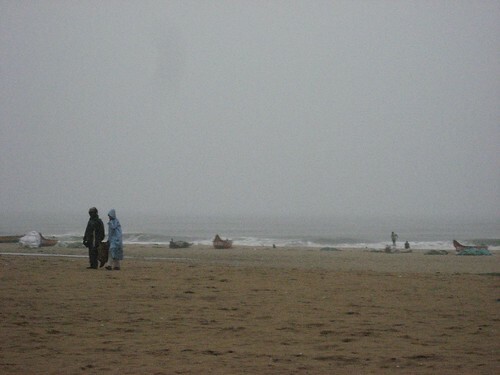 It has been raining heavily since yesterday and that pretty much has emptied out the beach. These seem to enjoying the drench.. I think Chennai is getting ample rains in the past few years. I noticed that you are a runner and I am happy to learn about 'Chennai Runners'. I have started running recently and I will be doing my first Half marathon in a couple of weeks. Though I am from Chennai, I live in San Diego now. I will definitely join you all for a run when I visit chennai the next time. Thanks a lot for the post about Randy Pausch, his talk was really uplifting. Btw. I blog at http://www.parasar.com . I will post about my running 'adventures' regularly there. Yes.. pl. do join us when you visit Chennai.. In your blog picture is very nice & your blog is also nice.I really liked ur post, thanks for sharing. Keep writing. I discovered a good site for bloggers check out this www.blogadda.com, you can submit your blog there, you can get more auidence. 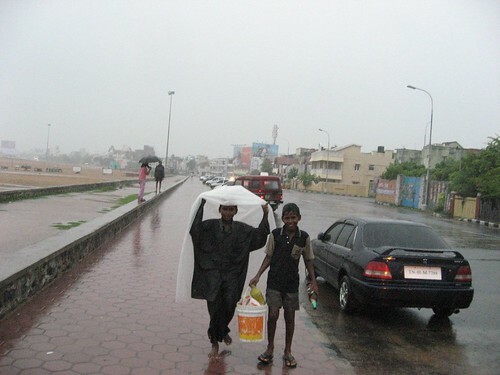 Your post about the rains in Chennai only aggravates that acute feeling of nostalgia. I moved out of Chennai a month back, out for a year, and would always look forward for this time of the year. And I don't think there's a ban on the iPod there! btw.. I am part of the ChennaiRunners and looking forward to the run with my iPod..